Just a short post to encourage our readers to check out the very excellent Pyromaniacs blog (a.k.a., Team Pyro). 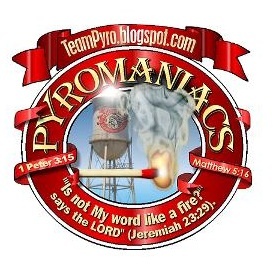 For any of our readers who aren't familiar with Pyromaniacs, Team Pyro is a blog that features posts on a wide array of issues in today's church. They have been an invaluable resource to us as well as to many Christians seeking to grow in discernment. Team Pyro was founded by Phil Johnson, who serves as executive director of the media ministry of Grace To You. In addition to Phil Johnson's articles, Pyromaniacs also features posts by writers Frank Turk and Dan Phillips, author of God's Wisdom in Proverbs and the newly released The World-Tilting Gospel (book review on this to be forthcoming). Many thanks also to Pyromaniacs for recently adding Sola Sisters to their blog roll.